Google Maps has just been updated and now includes public transport directions. 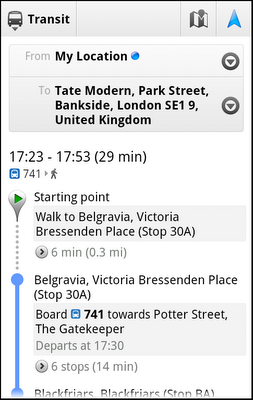 Available for iOS, Blackberry and Anddoid it’ll even get you around the tube with Transit Navigation (Beta). Find your destination, choose “Directions” and you’re off. If you’ve tried it to get around London by bus or tube let us know how it performs.